Today I’ll be going over Naked 100 Brain Freeze which features an entirely new flavor combination alongside a cooling menthol. Brain Freeze e juice features a trifecta of fruit flavors, starting with the pomegranate, followed by the sweetness of ripened strawberries, and topped off with kiwi tartness. Together these three fruits create a medley of sorts that is typically found in Hawaiian crafted resort drinks because of their richness and also because of how the flavors compliment the weather you’d be enjoying. Brain Freeze is one of those menthol infused e liquids that matches its main category of flavor with the same powerful cooling effect via its menthol. This is a strange phenomenon because others have rarely gotten the right balance without turning the eliquid into a minty experience. Brain Freeze continues to impress even after the initial shock wears off, why? Because the menthol used for the cooling effect is so top shelf that it doesn’t degrade with age as can happen to other brands. Investment in quality flavor extracts has been the key to Naked 100 E Liquid’s success and it continues as can be attested after going through a full bottle of Brain Freeze e liquid. The new IJOY X3 Kit is powered by triple 20700 battery and its maximum output can be reached 324W for great vaping experience. With the included 18650 adaptor, captani X3 is 18650 battery compatible. IJOY X3 Mod equipped with a big size color OLED. Equipped with new IJOY Captain tank featuring Bulb Pyrex Glass Tube, it comes with large 8ml e-juice capacity with bubble glass tank. Ijoy captain x3 tank with the 810 unique wide bore resin drip tip allows users to intake adequate amounts of vapor with optimal flavor recreation. It also feaetures inheriting the sliding top filling system and interchangeable filling gasket. The S-Priv Box Mod is yet another amazing release from Smoktech. The device features 230 watts of power, a skull design with hat, a color customizable built-in LED in the skull’s eyes, a full color display with changeable fonts, adjustment buttons integrated into the hat, an ergonomic firing key and versatile temperature control. 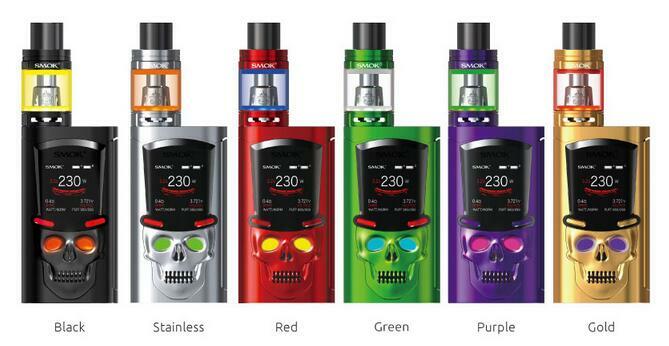 What really catches the eyes as soon as you see the S-Priv Kit is the skull on the face plate. It wears a hat that integrates the full color display and adjustment buttons. The skull’s evil looking eyes light up thanks to an LED that can be set to 3 patterns and which can be changed to four different colors: balck, red, sliver, white, gold. Inside the hat, you will see a full color screen of which the fonts can be set to blue, purple, brown, red, silver or green. 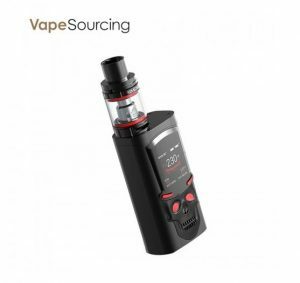 On the menu, you will find vape data that is neatly organized with a wide range of info such as current power, current mode, current resistance, current temperature, number of puffs taken, total puffs, two battery bars and more. The firing key was designed specifically to be ergonomic and spans one entire side of the mod. The unit is also compact thanks to dimensions of 86mm x 47mm x 30mmand light with a weight of just 155 grams. Dual 18650 batteries power the Smok S-Priv Box Mod. These can be accessed by sliding a knurled panel on the bottom to expose two battery slots with clearly marked polarities and gold plated contacts. The cells may be recharged while inside the device via the micro USB port on the back. Multiple hardware protections safeguard the batteries and also prevent taking puffs that are too long, overheating and short circuits. 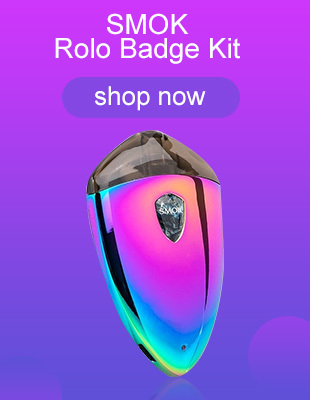 And you’ll get an alert when the batteries’ charge levels are low, while an intelligent atomizer recognition system will inform you of your atomizer’s coil resistance. 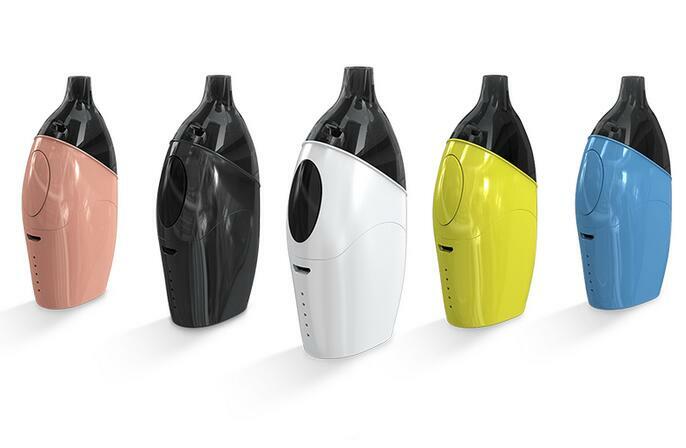 Technically speaking, the box mod is as versatile as any Smoktech product. 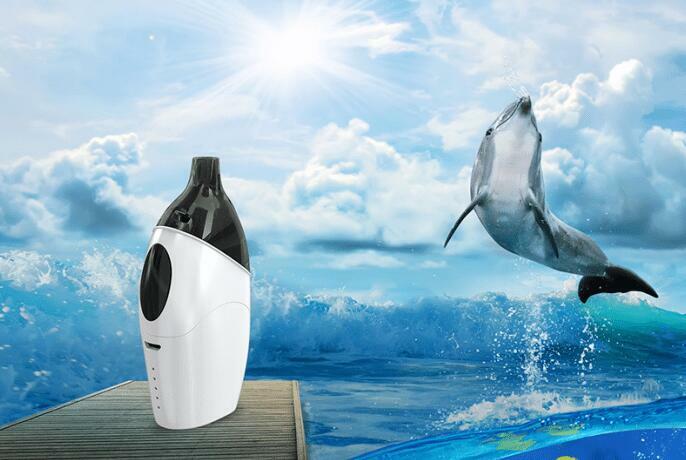 The maximum power tops out at 230 watts and temperatures can be set from 200 to 600 degrees Fahrenheit. In the compatibility arena, this unit also does not disappoint. Variable temperature operation works well with all heating elements like stainless steel, titanium, nickel and resistance capability is a rock bottom 0.05ohm. 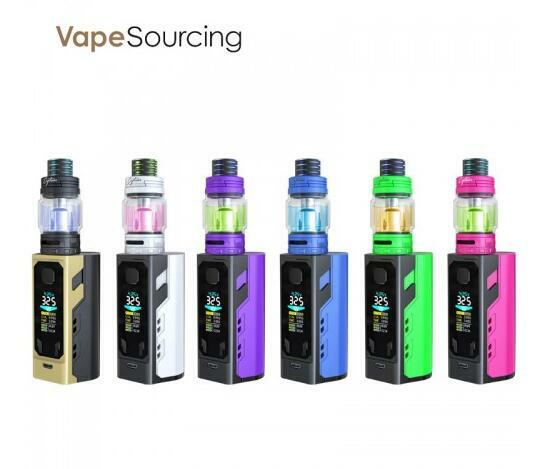 If you decide to get the full kit, you will get the mid-wattage TFV8 Big Baby Light Edition. Instead of this atomizer, we recommend buying the latest high powered TFV12 Prince tank from Smok for massive vapor production and a perfect color combination. Author buyadminPosted on November 6, 2017 November 6, 2017 Categories E cigarettesLeave a comment on Hello world!